The riparian strips are at least 10 to 15 meters wide between the aquatic environment and the terrestrial environment, which is necessary to protect the natural habitats of wildlife. This buffer band is necessary for ecological and biological systems. 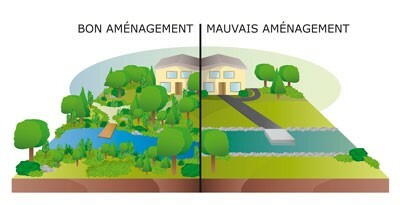 Forestry, agricultural and construction activities can affect riparian areas. You must keep the vegetation there, even that cutting grass is prohibited. So before starting work, contact the Department of the Environment.